For this weeks 3 Colour Challenge tutorial we will be using the Perennial Birthday stamp set. It is one of my favourite set as the images and nice and simple! Don’t forget to use this months Hostess Code to receive a gift from me!! The current hostess code is shown on the left of my blog. Learn more here !! 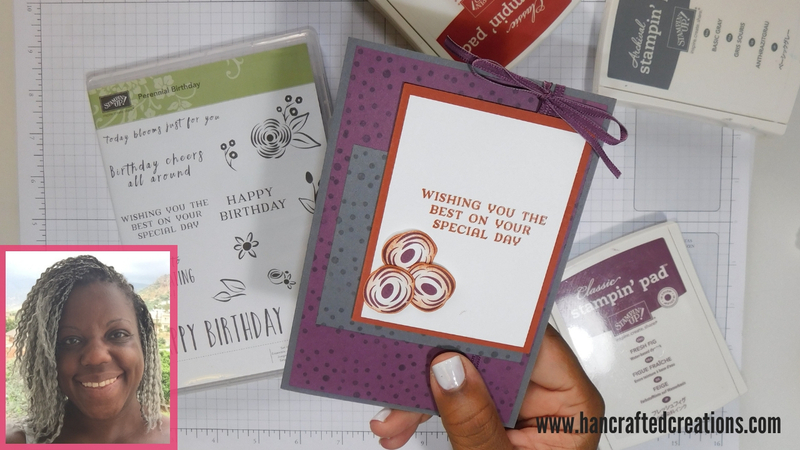 How to make a gift box for your handmade cards – Free card class. Next story How to make an envelope mini album. Previous story Stampin’ Up! Bonus Days Are Here! All content on this blog is the the property of Hannah Jones. Classes, services and products offered here are not endorsed by any company, videos, photos, ideas and articles are shared for personal use only and may not be removed, duplicated, or copied without permission. HanCrafted Creations © 2019. All Rights Reserved.